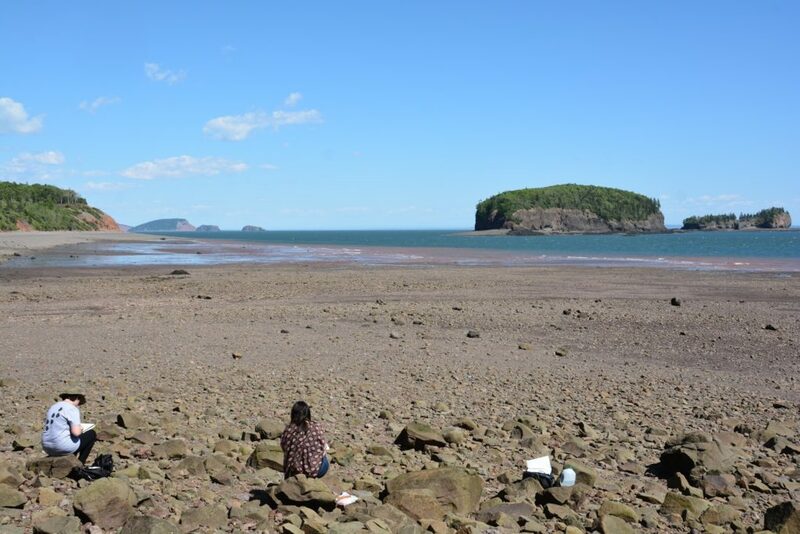 The Fundy Geological Museum, in Parrsboro, Nova Scotia, organized a Coastal Drawing Excursion on June 18, 2016. The excursion was organized to explore the use drawing coastal landscapes as a museum experience. This initial pilot demonstrated that for participants the activity of drawing increases and extends the time spent observing and connecting with the landscape. The tempo of seeing and drawing requires time, which is necessary to witness the speed and vastness of the changing tides, notice the diverse wildlife and observe the dramatic coastal geology. The excursion also showed that ‘demonstrative drawing’ by a guide can be used to educate and share rich visual information very directly with participants. 10:00 am – Welcome & Intro: Examine Coastal Drawing Resources. Coffee/Tea. Weather is obviously an issue with an outdoor Coastal Drawing Excursion. During the pilot, the day was sunny but had high winds develop later in the afternoon. In case of rain the program can be modified to take advantage of small shelters at some locations, however not all sites would be suitable. In general, participants should be advised that the weather is typically cooler along the Bay of Fundy coast. Suitable footwear is required for walking over rocky beaches. The guide provides direction to safe and interesting locations. The locations are chosen to provide interesting views of the tides, geology, and overall coastal landscapes. The coastal landscapes are likely the most obvious subjects, but the terrain is also interesting. 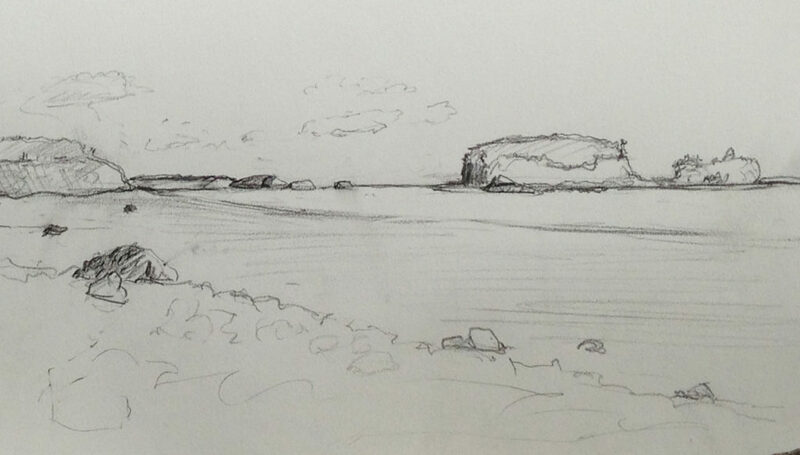 A “to scale” drawing of a cobble beach is something that is attainable within a short time. It encourages participants to observe the details of the rocks in detail. Detailed drawings of beach debris, logs and seaweed can also be of interest. At the site, participants are left to do drawings in their sketch books. The guide may provide occasional discussion, instruction, or encourage use of new techniques. The guide can also use demonstrative drawing to convey information about various landscape or geology features, using the act of drawing as a visual map of information being shared. Drawing of Two Islands and Five Islands in the distance. June 2016. 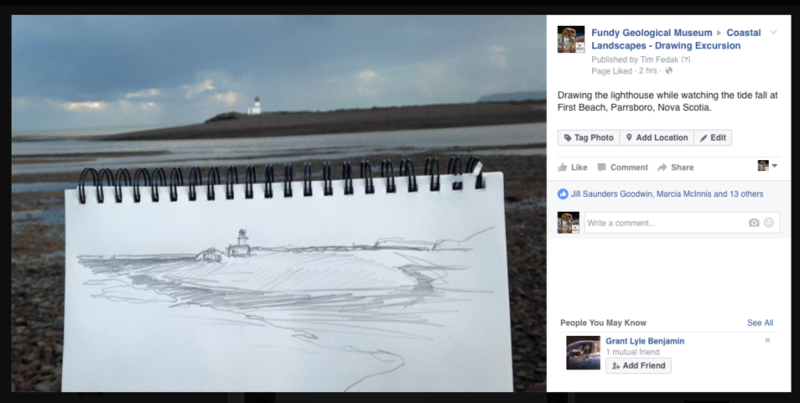 The opportunity to take time to observe a changing tidal landscape with drawing, typically involves anywhere from 5-15 minutes. In this time, an observable change will be noticeable. For the change to be most apparent, it is important to establish a reference point at the beginning of the drawing.Participants might be encouraged to write a few words to identify smells or sounds that they are hearing during the drawing process. The physical drawings also act as memorable and valued objects they can share with friends and family. The participants can be offered an opportunity to frame (or mail) their drawings as gifts. Participants can also be encouraged to consider other complimentary events and programs. Program scheduling should enable participants to enjoy an evening of live-theatre (Ship’s Company Theatre), a nice dinner out, or experience Yoga on the Ocean Floor. Drawing would be attractive for those interested in purposely slowing down and be reflective, establishing a deeper connection with an engaging landscape. Prentice Hall Press, New York, 1987, 206 pgs. Nature Drawing is an excellent resource book for those interested in teaching or learning how to learn about the natural world through direct observation drawing. Clare Walker Leslie has produced a book that provides many clearly explained exercises that will help people learn from direct observation and drawing. There are several good quotes scattered through the book that convey the benefits of drawing for learning about natural history, and also the benefits of drawing for learning improving observation skills. Nature drawing is about learning to see as much as it is about learning to draw. 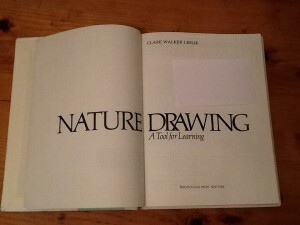 There are four main exercises that Clair Walker Leslie promotes for improving drawing skills. These four methods are explained succinctly and used several times in the book to demonstrate how drawing and observation skill can be increased with attention and practice. The importance of promoting observation skills is scattered throughout the text and lessons. Before even mentioning the four drawing exercises, the first exercise is “Observation” – that does not involve putting pencil to paper at all, but simply looking deeply and with intention. This book will be a useful resource for future teaching activities. 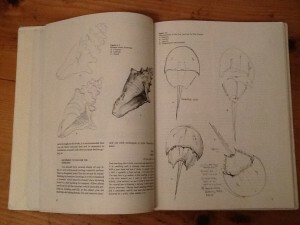 After the introductory chapter about drawing exercises and methods there are a series of chapters that focus on techniques for observing and drawing specific natural history topics such as plants/flowers/fruits, trees/shrubs, animals, birds and landscapes. There is also a chapter devoted to the benefits of keeping a field sketchbook. The Prentice Hall version does not appear to be in print anymore, although used copies are available online. The ability to make meaningful observations and use visual skills to document physical features and spatial relationships are two fundamental skills of a professional geologist (Liben and Titus 2012). Visual skills training can have positive and lasting affects on learners at all ages (Meadow et al 2012), and improving the spatial skills of individuals in geoscience education is a meaningful strategy for university education programs (Newcombe 2012). Becoming a professional includes learning to observe features and visual patterns that are of relevance to the work of a geologist, as in any profession (Bouderau 2008). We “learn to see” like a geologist, a physician, or any other occupation (Elkins 2008). The ability to draw and observe are considered essential by many successful natural scientists (Canfield 2011). Drawing and visual skills are highly desirable for success in science, technology, engineering, and mathematics (STEM) disciplines (Liben and Titus 2012). The following preliminary results describe the results of a two-week visual skills training activity developed for the first two weeks of this undergraduate paleontology course. The training activity involves two lab sessions with facilitated drawing and observation skills activities. Two 3-hour weekly labs focused on formal observation drawing skills were provided to 35 undergraduate students in a second year paleontology course . Short questionnaires were provided before the first lab (Figure 1) to gauge students’ prior experience with observation drawing and evaluated students’ confidence in observation and drawing skills. Figure 1: Pre-Learning Questionnaire provided before the first of two labs that focused on observation and drawing skills. The two three-hour labs included a number of short activities facilitated by the instructor who had prior experience with drawing and scientific illustration. Activities were designed in order to provide students with understanding and experience with the importance of scale (1:1 vs 3:1), line quality (soft vs dark), edges and surfaces, proportions, attentive observation, drawing with grids, shapes, labels, and illustrations in publications. Each lab included a rubric that was used to assess the students drawings. Activities included drawing specimen photographs that were displayed on two large screens in the front of the lab. These photographs were shown for 30-60 seconds to encourage rapid drawing and high-attention observation. Specimens (crab carapaces) were also distributed to allow students to draw natural objects with increased attention to details. Students handed in their lab books at the end of the labs, which were marked by the teaching assistant according to the rubric that students received at the start of the sessions. 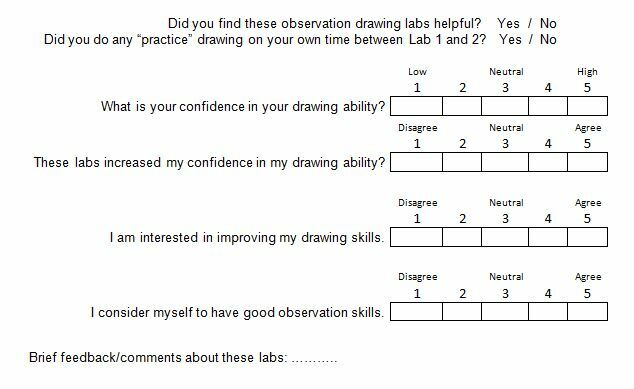 At the end of the second lab, a post-learning questionnaire (Figure 2) was provided to students to assess changes in students’ confidence in drawing skills and observation skills. Completion of the pre-learning and post-learning questionnaires was voluntary and students were asked to complete the paper forms anonymously but to include an four digit number (last digits of their phone number), to link pre-learning and post-learning answers. All results were tallied by the teaching assistant to ensure all student feedback remained anonymous. Figure 2: Post-Learning Questionnaire provided before the first of two labs that focused on observation and drawing skills. Twenty-six (26) of the pre-learning and post-learning questionnaires could be linked with a non-identifying number (last four digits of phone number). Among these twenty-six students, 56% (n=14) said they did not take art classes in high-school, 44% (n=11) did take art in high-school, and one did not provide an answer to this question. A strong majority of students said it was a long time since they had drawing lessons (Figure 3). Figure 3: Student responses to question on Pre-learning questionnaire. 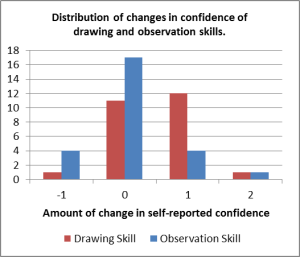 Comparing the changes in self-reported confidence in drawing ability after the two labs shows a marked increase in confidence among the students (Figure 4). Comparing responses in pre-learning and post-learning questionnaires (Figure 5) found a majority of students increased their confidence in drawing skill by at least one level, although one student’s responses represented a decrease in confidence after the labs, while confidence in observation skills did not show a strong increase. 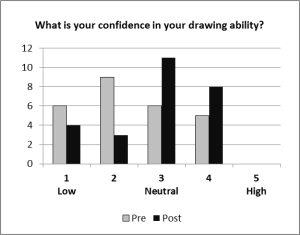 Figure 4: Comparing the self-reported confidence in drawing skill between Pre and Post Learning questionnaires. Figure 5: Number of students that experienced an increase (+1, +2), decrease (-1) or remained unchanged (0) in confidence of drawing skills and observation skills. I thought the labs were helpful in picking up tools to help with field sketches. I know it is important to be able to look at something and pull out the important aspects in a sketch and I feel these labs helped me to develop skills to do this. enjoyable, haven’t really done any drawing since grade 10 art class. While most comments were positive, two students provided negative or neutral comments, suggesting the labs were “a little dull” or “somewhat useful”. The results of the pilot appear to be of interest and helpful for the students. The students were highly attentive and engaged during the facilitated lab activities. The students’ have continued to use drawings in subsequent labs, providing them an opportunity to build their observation drawing skills. While confidence in drawing skill increased markedly after the two labs, the confidence in observation skills did not show a similar increase. The development of “confidence” in observation skills may require more time, and the labs may have highlighted the previously unappreciated challenges of accurately observing details. While there may have been improvements – there may also have been increased awareness that observing details is a complex skill. New labs that provided specific observation drawing skills provide students with improved confidence and encourage them to continue to develop their observation and drawing skills. Boudreau J D, Cassel E J, and Fuks A, 2008. Preparing medical students to become skilled at clinical observation. Medical Teacher, (9-20) pgs 857-862. Canfield, M. R. 2011. Editor. Field Notes on Science and Nature. Harvard University Press, Cambridge, Massachusetts. 296 pgs. Elkins J 2008. How to use your eyes. Taylor and Francis Group e-Library. 272 pgs. Liben L S and Titus S J, 2012. The importance of spatial thinking for geoscience education: Insights from the crossroads of geoscience and cognitive science, in Kastens, K.A., and Manduca, C A, eds., Earth and Mind II: A Synthesis of Research on Thinking and Learning in the Geosciences: Geological Society of America Special Paper 4886, p. 51-70. Meadow N, Uttal D, Tipton E and Newcombe N, 2011.Training spatial skills: What works, from whom, and for how long?, in Carlson, L. Hoelscher C, and Shipley T, eds., Proceedings of the 33rd Annual Conference of the Cognitive Science Society: Austin, Texas, Cognitive Science Society, p. 2260. Newcombe. N. S. 2012. Two ways to help students with spatial thinking in geoscience, in Kastens, K.A., and Manduca, C A, eds., Earth and Mind II: A Synthesis of Research on Thinking and Learning in the Geosciences: Geological Society of America Special Paper 4886, p. 85-86. I found Michelle Fava’s article “Developing a Cognitive Model of Observation Drawing” stimulating for my work in thinking about use of observation drawing as a pedagogical method in clinical and natural sciences. The article is articulate and informative. There were several points of particular importance. The results suggest observation drawing can be divided into two parallel and mutually supporting processes of evaluation (strategic thought) and attention control. The artists training in controlling (visual) attention would seem to be an important basis for improving observation acuity – citing Kozbolt references. The suggestion approaches a core interest of mine in that training in observation drawing for clinicians may improve their (clinical) observation skills in general. An overly dominant assessment culture may have an affect of diminishing the ability to suspend-judgement (evaluation), important for exploring new options. Observation drawing requires establishing patterns of suspended judgement, the periodicity varies between individuals, and this suspension may promote open and creative problem solving skills more generally outside of the drawing activity. Paul Thagard recently presented a Killam Lecture at Dalhousie University titled “Eureka, How Creative Intuition Results from Three Processes“. The lecture was fascinating and well presented, providing an overview of a new cognitive theory of how creative discovery is established at the neural cognitive level. Throughout the talk, Dr. Thagard gave considerable attention and praise to the work of his college Dr. Chris Eliasmith who has recently published the book titled How to Build a Brain. Dr. Thagard explained how three components of cognitive processes could be used explain creative intuition; neural representation (how ideas are represented in the brain), binding (how representations are combined), and competition (between bindings). Another key concept was the establishment of semantic pointers; representations that are bound together to form symbolic units that link diverse neural associations (motor, sensory, emotion,..). Semantic units can be combined in novel ways, providing the basis for creative discovery, and also maintain associations to emotions by the bindings of component neural representations. Dr. Thagard standing at the front of the lecture hall used the audience’s perception of him as an example of the theory. Individual gazes (sensory stimulous) cause clusters of neurons to become excited in a temporal pattern, and these representations become bound together to establish a new temporal patterns of neural representation. 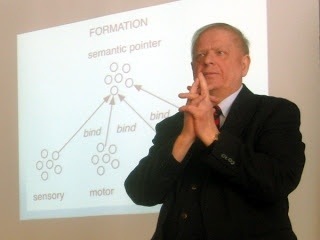 “Bindings of bindings” result in unique neural representations, of a man at the front of the room, wearing a blue blazer and red tie, with a voice conveying meaningful words. My thoughts during the lecture — This neurologically based understanding of cognition seems useful for the consideration of how observation drawing could be useful for learning and creative discovery. The linkages between emotions, motor, and sensory neural representations, remain present in the resultant (binding) neural representations. Active observation of a subject is linked with motor neurons and the activity of drawing marks on a page. The activity of drawing marks on a page would also affect the neural representations, strengthening some meaningful aspects of the visual sensory stimulus that is being generated from observing the subject. 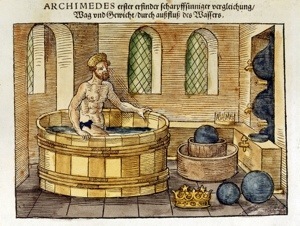 Dr Thagard also used the example of Archimedes, observing the water level rising when he entered the bath as the stimulus that resulted in the Eureka moment when he realized how he could measure the volume and density of the King’s crown. This example was especially useful for highlighting the importance of observation, and the impact of keeping the attention open to “seeing” the world in new and insightful ways. I look forward to reading some more about Dr Chris Eliasmith’s work, and continuing to follow Dr Thagard’s ideas about creative intuition. The Killam Lectures succeeded in providing a stimulating exchange of ground breaking research that spans the sciences and humanities. A fundamental aspect of observation drawing is the observation of surfaces, objects, tones, and colour features. However, the depiction (drawing) may occur immediately during observation (tracing) or after some time has passed, even half-a-second during glances, memory is involved in transcribing the record. The extreme form of glance drawings are those purported to have photographic memory. There are several activities that would be useful for exploring the temporal aspect of observation and drawing. Observe for 30 seconds then draw. Observation drawing as an action, involves the depiction of observed features and spatial relationships. With an intention to accurately depict what is observed, the drawings can be stylized (like a map) or highly rendered with accurate construction of volume, shadow, and perspective. A larger drawing is required for recording details. The act of drawing from observation involves heightening the attention to spatial relationships, surface and texture details. Marks (pencil) on a surface (paper) become artifacts (records) that function to document observed details. 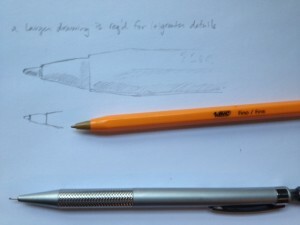 Skill in the documentation (rendering) aspect of drawing involves hand-eye coordination and training, as well as knowledge of using marks to convey Cartesian spatial relationships. Observation skills are enhanced by directing cognitive attention (value) to what is observed, and extending the duration of observation focused on a singular subject or scene. The importance of cognitive attention focused on visible surfaces and spacial relationships can also relate to mindfulness practice. Thought and care should be taken when using images in medical education assessment. 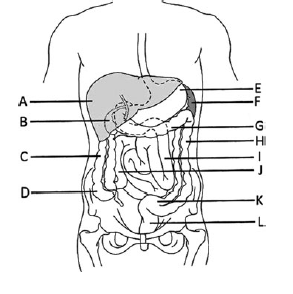 An example of an image used in assessment of anatomy knowledge, from Vorstenbosch et al 2013. The use of images in assessment can increase the difficulty of some questions, and lower the difficulty and discriminating power in others, depending upon the type and complexity of images that are chosen (Vorstenbosh et al 2013). Surprisingly, the use of images in assessment has received almost no previous attention in scholarly work and as our media become increasingly digital the use of images is likely to increase. Vorstenbosh and colleagues have provided an important contribution to an area that requires much more attention. The use of images in assessment as stimulus format (questions) is an area that can use additional attention. Another area for further examination is how images (drawings) are used as response format, with students providing drawings as answers. Drawings are visual representations of knowledge that includes spatial and can include descriptive information when labels are included. When is it most appropriate to request a drawing as an answer to a question? Does a drawing provide unique benefits for assessing some types of knowledge? Vorstenbosch did not consider the use of drawings in assessment. Their focus was on the use of images as stimulus format in anatomy assessment. Surprisingly, they were unable to find any previous published work in how images impact assessment, which suggests their work may become a starting point in a new field of inquiry. This area could use more research and Vorstenbosch et al have provided a meaningful contribution. Vorstenbosch M., Klaassen T., Kooloos J., Bolhuis S., and Laan R. 2013. Do Images Influence Assessment in Anatomy? Exploring the Effect of Images on Item Difficulty and Item Discrimination. Anatomical Sciences Education (6) 29-41. Please feel free to share your thoughts or comments below…. The human body is obviously of great interest to the physician; the patient’s body and mind are the focus of health care. Visual artists also have great interest in the human body, explored most directly through life-drawing studies. Sitting woman, drawing in black crayon, school of Rembrandt (17th century). From Wikipedia. While there is a long history of using ‘living models” in anatomy training (Collett et al 2009), attempts to use life-drawing sessions in medical education are more recent and rare. Although educational useful in several ways, initial reports suggest life-drawing is not appear to be helpful to students for learning anatomy (Collett et al 2009, Phillips 2000). It seems that the emotional charged nature of the naked human body involved in life-drawing and limitation to visible surface anatomy limit the utility of life-drawing for teaching of anatomy. The use of life-drawing does appear to be helpful for providing students with a more holisitic view of the human body (Phillips 2000) or to explore ideas of cultural stereotypes related to attractiveness and beauty (Collett et al 2005). Life-drawing sessions also provide opportunities for observation drawing training and students do feel that the observation drawing does provide increased clinical skills of hand-eye coordination and an ability to observe critically (Collett et al 2005). Although life-drawing may have limited utility for teaching anatomy topics, when students engage in observation drawing training that uses anatomical specimens (bones, pro-sections), the sessions improved or allowed discovery of unrealized drawing skills, helped them to observe structure in new ways, and to consider morphology from different perspectives (Mitchell 2001). Responding to Phillips’ use of life-drawing, Mitchell’s letter to the editor provides a brief summary of a semester long course titled “Images of Anatomy” offered to BSc degree students at St George’s Hospital Medical School from 1999-2001 focused gross anatomy training within a clinical context. Part of the course involved three 2-hour sessions on drawing anatomical images taught by a professional art teacher. Providing formal observation drawing skills training to medical students that uses anatomical models and pro-sections as subject matter is what was continues to be explored at Dalhousie Medical School (MODEL Program). Collett T. J. and McLachlan 2005. Does ‘doing art’ inform students’ learning of anatomy? Medical Education, (39) 521. Collett T. J., Kirvell D., Nakorn A., and McLaclan J. C. 2009. The role of living models in the teaching of surface anatomy: Some experiences from a UK Medical School. Medical Teacher, (31) pgs. e90-e96. Mitchell B. S. 2001. Life Drawing Classes (Letter to the Editor). Medical Education (35) 516-517. Phillips P. S. 2000. Running a life drawing class for pre-clinical medical students. Medical Education (34), pgs. 1020-1025.